The Dillon as seen from Hargett Street, August 2017. 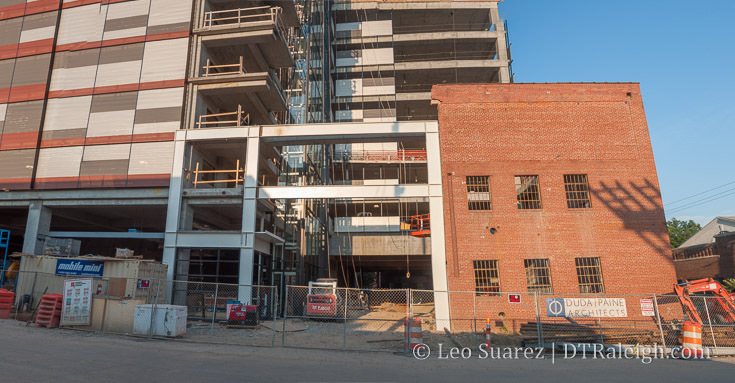 2017 has really been quite a year for The Dillon, the mixed-use project in the middle of the warehouse district. 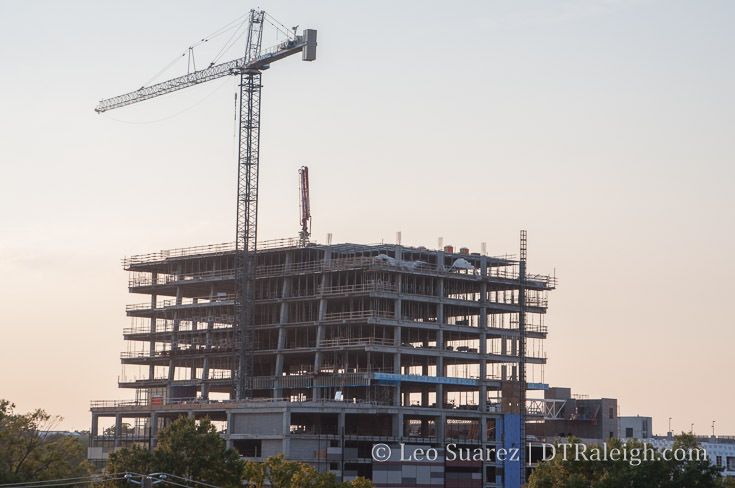 While construction started last year, it’s this year that the project rose up and took shape. 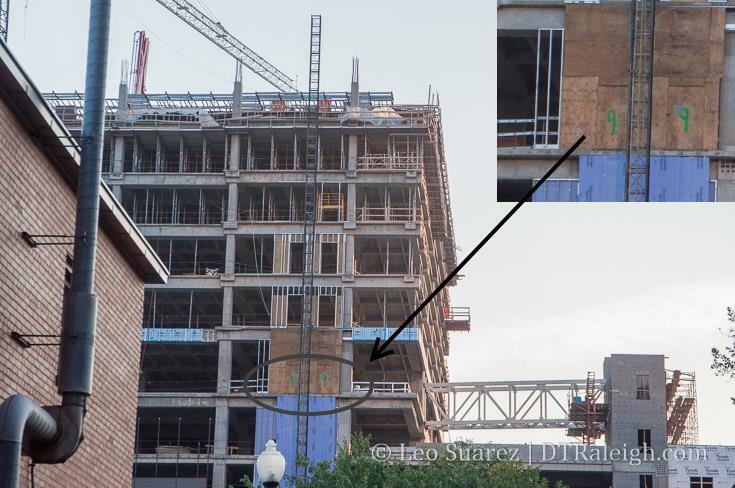 While the 17-story office tower component continues climbing, the lower levels are getting their facades put into place giving us a small sense of the new built environment in that area. Furthest along are the residential units. With their real estate team teasing us with apartment, lobby, and rooftop renderings on their Instagram account, you can’t help but get excited for the 400 block of West Hargett. The team wants to put string lights across the street and with face-to-face retail spaces along most of the block, I imagine the spaces could be an easier sell than others. The Dillon residences, facing east on Hargett Street. August 2017. Brick is a must for a warehouse district apartment, no? The Dillon, corner of West and Martin Streets. August 2017. The Dillon portico, corner of West and Martin Streets. August 2017. Martin Street will see a lot of retail as it has the most space. The big news recently was the announcement of an Urban Outfitters for The Dillon but the exact space wasn’t announced. Speculation points for the new big retail store to go into the spaces along Martin Street as a collective 15,134 square feet exists here. For a reference point, the store in Durham’s Southpoint takes up 11,871 sq. ft. so no doubt they can make it work here. 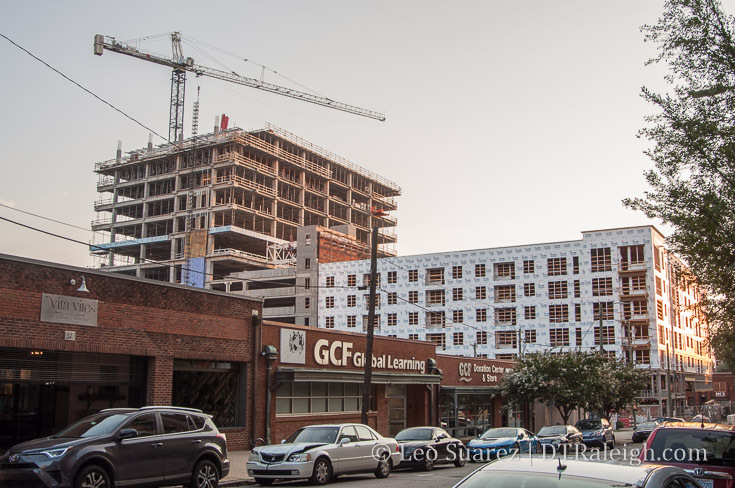 At the same time though, when combined the two sides to Hargett Street have over 11,000 square feet of retail space. The spaces look tall so if you do a two-story internal store (like the one in Durham) you could make it fit in a smaller footprint. Catching up on the tower, if you want to count the number of floors rising up, here’s a guide. That’s the ninth floor labeled at the construction elevator so at the time of this writing, floor 14 (15th floor if you skip 13?) is being worked on. No doubt this tower will top out before the end of the year and have a considerable amount of facade put up. Thank you so much for truly being our “reporter on the ground “! You’re ability and desire to go in depth truly sets you apart from others, and for that I am truly thankful!!! Great job!!! Thanks Robert! This is a transformational project for sure. 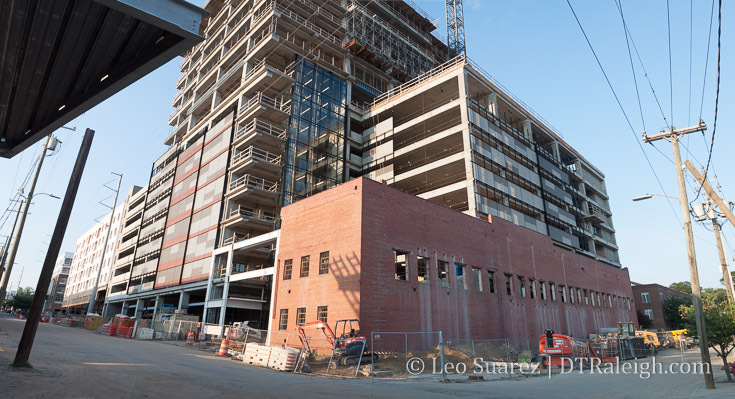 New Raleigh has posted new pictures of the gateway building into Raleigh! I have some aerial shots of the construction if you’re interested. I’m looking forward to seeing this project in person. Thank you for the update. 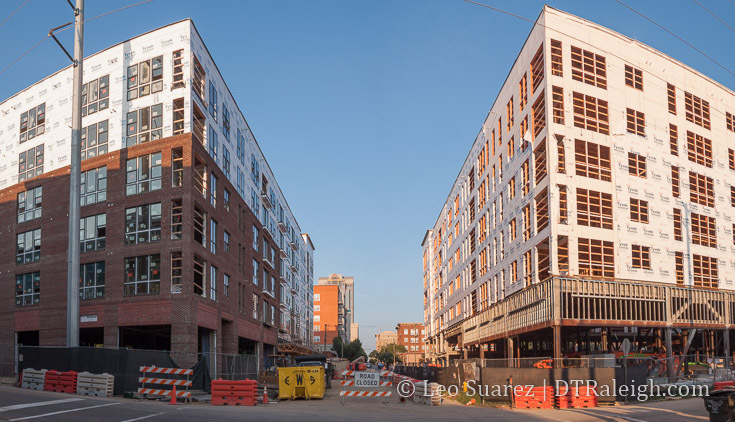 The Dillon is one of the few upcoming projects in Raleigh that seems architecturally inspired. The proposed “Energy Positive” Gateway building is intriguing, but the latest renderings left much to be desired visually, in my opinion. The only other project that I can think of that looks the least bit interesting from an architectural point-of-view would be the MLS Stadium. I was in Columbus, OH a few years back and really liked the Short North District with the arching lights across High St. What Kane is looking to do with lighting at the Dillon is different but, still, it should be a very attractive addition to the project. In your 5th picture, corner of West and Martin st. the brick color looks ok but the reddish/orange panels don’t look good. However I love the dark colored glass! Any update on the Lundy Groups’ project across from Campbell Law? The founder died and it appears the son has taken over. I wonder if the lenders are now concerned there is a ‘junior’ guy versus dad running the show. Giving $200 million to a guy without a track record is probably a stretch. When you look up the son, he also runs a ‘travel business’ which basically appears to be taking people to the caribbean. Not sure that merits a big fat real estate loan. Would Love to see a few more High rise buildings in the Warehouse District, it will be the spot to be in when you visit Downtown. Maverick GoRaleigh/GoTriangle/TTA has said they are planning something of that sort with their remaining block between the wye, Hargett and Union Station. I, for one, hope the Five Star building stays intact as it is much more vintage that most the rest, but I suppose we’ll see how it goes. Anyone know of what might become of that weird chunk of land inside the wye? I’m talking about that lot south of Hargett, NW of Union Station, east of Boylan…basically looks like a trash dump. Is that something used by the RR and therefore off limits to development? Kind of an eyesore. @Will. I agree. This plot of land needs some love. It looks like the tiny wedge of land to the east of the brewpub and west of the tracks is owned by “Raleigh Land Company LLC”. There are four parcels to the east of the track that belong to NC Dept. of Transportation and the Union Station Land is owned by the city of Raleigh. There’s a no man’s land between the Raleigh Land Co. LLC property and the ones owned by the Dept. of Transportation. Mark I hope so too, the five star Building should remain in tact as to make the Warehouse District more authentic. Not too Modern as it would reflect to the Old Days of Raleigh. I helped cater a Hopscotch related event this past Saturday night at the C.A.Museum. I Got to see the new construction up close and personal. West street is quite the urban canyon now and the new train station looks great. West and Martin is going to be a happening corner in a few months! I urge you guys to take a stroll thru the area. FYI… I was looking at a Video on Viemo of the Dillon Tower, it is pretty awesome. That should be the video for Welcome to Raleigh,even better a commercial for folks coming from out of town to see what Raleigh has to offer. If you don’t know what Im talking about, type in the dillon raleigh on goggle and see the link. it’s really amazing.